The original fruit jellies from Meltis with a delicious liquid centre. 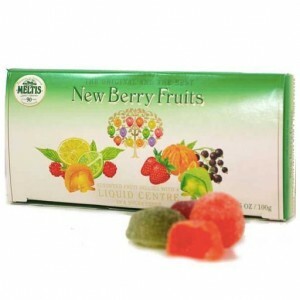 Newberry fruits are the original fruit jelly sweet that has been in production for many years. These iconic jellies were originally made in a confectionery factory in Bedfordshire. Over 100 years ago, these delights were founded and have been a huge hit ever since, especially with the sugar dusting! Production of this fruit jelly has now moved to Germany but the original, traditional recipe is still used so the taste is identical to that of over 100 years ago! As well as the original taste, the appearance of these colourful delights has remained. As you notice the array of different colours, with every bite you’ll taste a different flavour which includes Strawberry, Raspberry, Lemon, Lime, Orange and Blackcurrant. The next iconic feature is the sugar crust and delicious liquid centre which separates Newberry Fruits from any other fruit jelly. These jelly bulk wholesale sweets are packed with flavour and the taste experience that comes from the sugar crust and the liquid centre makes a memorable memory! Newberry fruits come in the traditional 200g box which has the embossed Hosta Meltis logo on the front with the phrase “the original and the best” and they certainly don’t disappoint!